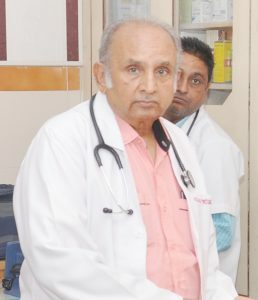 Dr S.K Bansal is a renowned Surgeon of malwa belt who is a pioneer in his field. He has more that 40 years of rich enriched experience. His experience is in General Surgery with specification in abdominal surgeries, hysterectomies, appendicectomies, cholecystectomy, piles etc..
His skills are accurate diagnose and minimal Surgical time leading to minimal risk. This strong points are : keen listener, patience, soft spoken. Regularly attends conference at national and state level to keep himself updated besides life time subscription to all Surgical societies.